What if architecture were inspired more by science than by art? 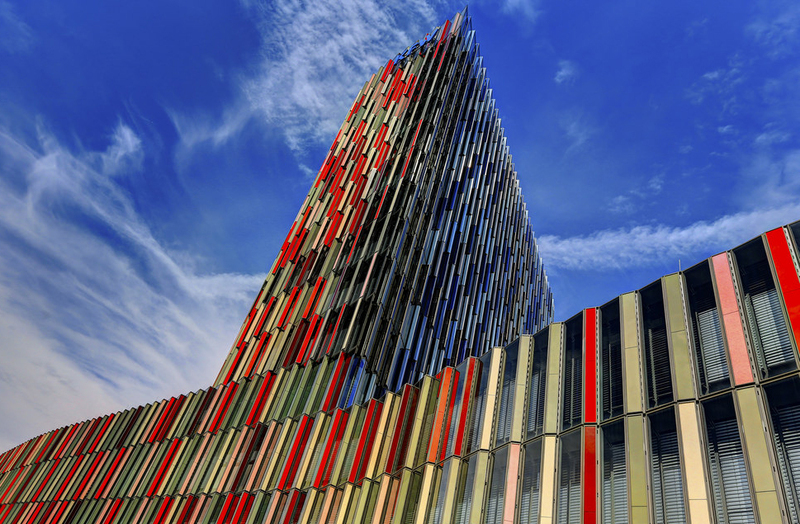 Sauerbruch Hutton, KfW Westarkade, Frankfurt. The tower's shape uses sun and wind to become one of the most elegantly efficient buildings in Europe. Photo (c) Igor Prahin. Early this month, when I wrote that architecture shouldn't be considered "art," design journalist Andrea O. Dean responded, "Clap trap! What's your point?" As another reader observed, my point seems clear: Portraying architecture as art justifies architects' self-expression (the earmark most commonly associated with "art") and serves little else. I routinely hear my peers legitimize the most expensive and wasteful of gestures for the most esoteric of reasons, under the guise of what starchitect Jean Nouvel calls "the mystery and the deepness." Don't mistake my rejection of art as a rejection of aesthetics. In fact, I wrote my book, The Shape of Green: Aesthetics, Ecology, and Design (2012), to illustrate how beauty, or sensory pleasure, is essential to the built environment. Yet, often what an architect passes off as beauty is merely what he/she likes, not what others love. Do we exist to serve ourselves or everyone else--you know, the people who actually live with our work? A friend asks me, If architecture isn't art, what is it? I replied simply that architecture is architecture and need not be compared to other fields. However, for the sake of argument, what if architecture were to learn more from science than from art? What if all design were driven by in-depth research and scientific evidence about what works and what doesn't? Imagine a built environment shaped primarily to benefit the triple bottom line of social, economic, and environmental value. People spend nearly 90% of their time indoors, and we are surrounded by buildings the rest of the time, since most of us live in cities now. More and more research confirms that high-performance design can have significant benefits for health and wellbeing. Just last month, a Harvard study found that design can double or triple cognitive performance. Furthermore, as I show in my book, a growing wealth of science in various fields reveals that certain shapes, patterns, textures, and colors--the designer's toolkit--are both widely appealing and beneficial for mental and physical health, in some cases lowering stress by as much as 60 percent. Yet, few architects seem to know this research at all, much less explore it in their work, and some reject it as "retreats to mystical order." Designers typically treat even the more familiar evidence (e.g., the benefits of natural light and fresh air) as incidental, not instrumental to design, and the untapped possibilities remain substantial. If every architect understood more about the science of wellness and the mechanics of attraction, how much healthier and happier could everyone in or near buildings become? According to current estimates, the built environment represents a staggering 87 percent of global GDP--$37 trillion in the US alone. As expensive as buildings are to build, the initial costs can account for as little as 5-10 percent of what an owner will pay over the lifetime of a building. Yet, few architects are trained in the economics of architecture, and the most famous architects--the ones most likely to be labeled "artists"--are notorious for budgets overruns and long-term maintenance problems. However, high-performance design actually can cost less while creating a significantly higher return on investment, cutting operating costs by up to half and increasing property value, sales, rents, and occupancy rates. Moreover, human resources account for over 90 percent of annual facility costs, and design can noticeably improve employee retention and attraction, absenteeism, and productivity. In the US, an additional ROI of just one percent across the entire building stock could yield billions. Better design pays off big. For the first time in recorded history, NASA reports, the concentration of carbon dioxide in the atmosphere has reached 400 parts per million, threatening life as we know it by causing higher temperatures, droughts, violent storms, rising seas, and loss of fauna, flora, and farmland. Buildings are responsible for half of energy and emissions and three quarters of electricity consumption in the US. On average, high-performance design reduces energy by a quarter and emissions by a third, and the National Renewable Energy Laboratory calculates that adopting current best practices can cut energy consumption in half--without any additional costs. Applying this to every building would cut total US emissions by 25 percent, half the amount needed to stabilize the climate by 2020. Yet, some superstar architects have dismissed sustainability as "bogus" and having "nothing to do with architecture." But consider this: Up to 90 percent of the impact of a building or product is determined in the earliest stages of development. Design is the key to reversing climate change. How much could architects accomplish if we focused less on personal artistic expression and more on how scientific evidence can generate better buildings and places? Now more than ever, the industry needs incredible creativity and ingenuity, but, as I wrote last year, true innovation creates tangible value, not just imagery for imagery's sake. The profession faces extraordinary new challenges and opportunities--if only more of its leaders would lead.